« Who is the greatest minor league baseball player to have never made it to the major leagues? 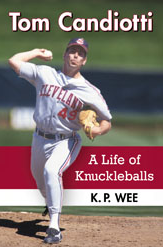 The best knuckleballer over the past 25-30 years….? In the Blue Jays’ 10-2 victory over the Mariners on September 23, knuckleballer R.A. Dickey pitched a five-hitter through seven innings to thwart Seattle’s fading playoff hopes (while Toronto hammered M’s ace Felix Hernandez for eight runs). For Dickey, he improved his record to 14-12 with a 3.78 ERA, the third straight season that he’s won at least 14 games. Well, I was asked recently on Quora.com: Who was the best knuckleball pitcher in baseball in the last 25-30 years? A lot of fans are going to come up with the names Charlie Hough and Tim Wakefield. Some might even say Dickey, who won the National League Cy Young Award with the New York Mets in 2012. I’m going to, however, go with former Indians and Dodgers knuckleball pitcher Tom Candiotti, who was the most consistent knuckleballer over the last 25-30 years. While Dickey had his one big season with the Mets (as well as a couple of other solid campaigns in New York where he pitched well but didn’t get much run support), he has not been that great with the Toronto Blue Jays in 2013-2014. He hasn’t been able to duplicate his success from that 2012 season, which kind of makes him a one-hit wonder. Wakefield will always be highly regarded in Boston because of his longevity and his being on two World Series championship teams with the Red Sox in 2004 and 2007, but he had some very ugly seasons where he pitched poorly. In his rookie year with the Pirates, he was nearly unhittable and was a postseason star as he nearly pitched Pittsburgh into the World Series. However, over his postseason career, he was hit very hard and compiled an overall ERA of 6.75 in 18 career playoff appearances. In his final four career postseason starts, Wakefield was 0-3 with a 10.47 ERA. He especially struggled against Cleveland in the playoffs, allowing at least five runs in each of his three career postseason starts versus the Indians. Yes, he wound up winning 200 regular-season games over a 19-year career, but his ERA was over 4.00 in 15 of those seasons. He had six seasons where his ERA was over 5.00. However, he always seemed to win because of good run support with the Red Sox, as he was 14-13 with a 5.14 ERA in 1996 and 17-8 despite a 4.58 ERA two years later. As for Tom Candiotti, he pitched 16 seasons in the big leagues, and though he finished with a career losing record and “only” 151 victories, he had an ERA over 4.00 only six times. Candiotti nearly won the ERA title in 1991, finishing with a 2.65 earned-run average that was second in the American League only to Roger Clemens (2.62). Had he allowed just one fewer earned run over the course of that season, Candiotti would have won the ERA championship. In 1993, he finished just 8-10, but suffered from atrocious run support while pitching for the Dodgers. That year, he was the ERA leader in the major leagues, pitching to a 2.43 earned-run average entering September before struggling in the season’s final weeks to finish at 3.12. In fact, for a full decade from 1986-1995, Candiotti had a 3.44 ERA, which was one of the best earned-run averages in baseball during that stretch. He also averaged 30 starts and over 200 innings during that decade, proving to be a very dependable pitcher for his clubs. He and Mark Langston were the only pitchers in the majors to work at least 200 innings in each season from 1986-1993, until the 1994 strike ended both streaks. His career ERAs after the 1995 season were 3.51 in the American League and 3.38 in the National League. Of his 151 career wins, 70 came in starts where he allowed one run or none. Even though he threw the knuckleball primarily during his career, he consistently had a 2-to-1 strikeout-to-walk ratio, meaning he consistently had twice as many strikeouts as he did walks. Yes, R.A. Dickey was 12-1 with a 2.15 ERA at one point during the 2012 season, and Tim Wakefield started 14-1 with a 1.65 ERA in 1995. However, Candiotti had similar brilliant stretches of pitching…but not the gaudy won-loss records to show for them because the quality of his teams. In 1991, for instance, Candiotti had a 2.01 ERA in his first 19 starts…but only a 9-8 record and was left off the AL All-Star team. In 1993, he had a 1.53 ERA over a stretch of 17 starts, but was 6-1 with 10 no-decisions. The same summer when Wakefield made all the headlines in Boston with that 1.65 ERA in 1995, Candiotti had a stretch of 13 starts where his ERA was 1.74 for Los Angeles. Alas, the Dodgers gave him very little support, resulting in a 4-6 record in that stretch. Naturally, over time his accomplishments are no longer remembered. Tom Candiotti never truly got any recognition because of the losing records he suffered while pitching for bad teams in Cleveland and Los Angeles. Had he gotten better support, he would have been better remembered. Or, if he had pitched today and gotten the same results, he would be talked about as a hard-luck pitcher because the baseball media now weigh more importance on other statistics and less on wins. During Candiotti’s time, it seemed that wins-and-losses were the be-all, end-all, and with his losing record he didn’t get as much press. Thus, he is forgotten today. On some lists on the Internet that talk about the best knuckleballers in baseball history, some bloggers cite Candiotti’s best season as 1988, when he was 14-8 with a 3.28 ERA. However, he won 15 games in 1990, nearly won the ERA championship in 1991, and from 1992-95 had the fifth-best ERA in the NL (behind only Greg Maddux, Jose Rijo, Tom Glavine, and John Smoltz). People have forgotten that he was one of the best pitchers in baseball for a while, knuckleball or not. To learn more about Candiotti and his career, check out his biography titled Tom Candiotti: A Life of Knuckleballs, which is available on Amazon. This entry was posted on September 24, 2014, 1:58 am and is filed under (Baseball) Life Ain't Fair..., All About Innings, Baseball, Baseball Biography, Blue Jays Baseball, Dodgers Baseball, Indians Baseball, Knuckleballs. You can follow any responses to this entry through RSS 2.0. You can leave a response, or trackback from your own site.